Supplementary materials for teaching Issue 15 are listed below. Translator Thoraya El-Rayyes discusses working with Arabic text and translating the work of Hisham Bustani, The Common’s Arabic Fiction Editor; read El-Rayyes’ translations of Bustani’s fiction in Issue 06 and Issue 11. Translator Elisabeth Jaquette explores “the anatomy” of a translated page (via Melville House); see also: Jaquette’s translation of “The Hush Void” by Mohammed Khudayyir (from Issue 11), and Jaquette’s introduction and an excerpt from her 2017 PEN/Heim Translation Fund Grant-winning translation of the 2009 short story collection Thirteen Months of Sunrise by Sudanese author, journalist, and activist Rania Mamoun. Translator Maia Tabet gives her 12 tips for translators (via ArabLit); see also: Tabet’s translations of work by Sinan Antoon in Issue 13 and Zakaria Tamer in Issue 11. Translator Alice Guthrie reflects on the process of translation for the Poetry Translation Centre; see also: Guthrie translates work by Rasha Abbas, Ala Hlehel, and Malika Moustadraf in Issue 11. Ghalib Halasa on the books and authors that influenced him. Read more short fiction from Elias Farkouh in Words Without Borders. Explore Ann Magella’s interactive web documentary, “Rafik Majzoub: Memoirs of a Screw” to learn more about the Majzoub’s life and art. Browse an interactive map of Issue 15. Read Jason Henninger’s take on the work of Ryunosuke Akutagawa over at Tor.com. Linda Ashok discusses imagery and individuality in poetry with Wale Owoade. Read an interview with Gary J. Whitehead on influences and rituals, courtesy of Massachusetts Review. Listen to Rosebud Ben-Oni on WKCR. Over at the Kenyon Review, Ben-Oni leads a roundtable discussion on writing workshops and mental health. Teow Lim Goh’s poetry collection, Islanders, on the voices of detained women at Angel Island, is featured on PBS NewsHour; for further reading, see “Coastlines” (Lim Goh’s essay about visiting Angel Island on The Common Online) as well as an interview with Lim Goh in which she discusses how and who she likes (and doesn’t like) to read (via Entropy.com). Richard Hoffman speaks with Doug Holder on the Somerville Public TV show “Poet to Poet: Writer to Writer,” and Amy Grier interviews Hoffman for Solstice. Laura Maher on “repetition with a difference,” for the University of Arizona Poetry Center; see also: Maher speaks with Christina Oddo about her poem “Awnings” in The Collagist. Read a short story by Noor Naga, winner of the Bronwen Wallace Award for Emerging Writers, about motherhood and migrant labor, set in the city of Dubai; watch Naga in conversation with other Emerging Writers. Watch a short segment on the work of Ricardo Pau-Llosa from PBS NewsHour. Read Catherine Pond’s essay on “Girls,” addiction and growing up (via Salmagundi). Read an interview with Moriel Rothman-Zecher on the evolution of his novel Sadness is a White Bird (via the Daily Californian). Watch “In Conversation with Martha Rosler” (via Another Gaze); see also: Paco Barragán interviews Rosler for ArtPulse. Read more short fiction by Kate Berson, as well as an accompanying interview, in SmokeLong Quarterly. 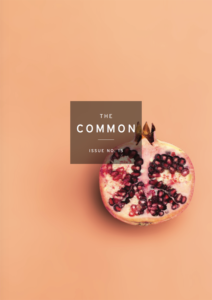 Read Marilyn Sides’ essay “We Lived in the Desert Then” on The Common Online. Read another place-based poem by Aran Donovan in Cider Press Review. Read another place-focused essay by Liz Arnold in Catapult. Read more short fiction by Emma Copley Eisenberg via Electric Lit. Read more from Linda Ashok and Catherine Pond in our October 2017 Poetry Feature. Work by Ned Balbo is included in our April 2016 Poetry Feature. Read more from Erica Dawson in our June 2016 Poetry Feature, as well as work from Issue 12: “Mary with Swag” and “Seventh-Day Adventist Kids are Pathfinders Not Scouts.” For further exploration, read a review of Dawson’s collection, The Small Blades Hurt on Slate.com. Read more from Marlin M. Jenkins and Jessica Lanay in our January 2018 Poetry Feature. Read more from John Allen Taylor in our March 2018 Poetry Feature. Read more from Maceo J. Whitaker in our February 2015 Poetry Feature; see also: read and listen to Whitaker’s poem, “Wordsworth in Poughkeepsie,” published in Issue 08. Read Jane Satterfield’s poems in Issue 03; see also: Satterfield’s take on her hometown of Baltimore in our Ask a Local column, and Caitlin Doyle’s review of Satterfield’s book Her Familiars.